If you didn’t like Keurig before because you could do just one cup at the time, you will love this new brewer. This small and compact 2.0 brewer can do a single cup, a to-go travel mug and it can also do a carafe. 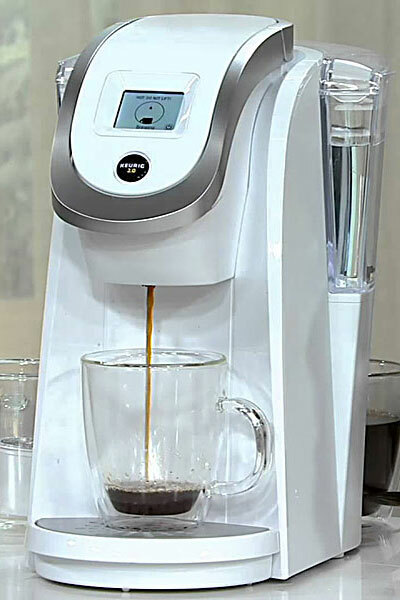 The Keurig 2.0 K200 is a part of a Keurig plus system. It’s the only model with the water reservoir on the back side. The tank holds up to 40 ounces and can be removed for easy cleaning. On top, there’s a 2″ black and white touchscreen with easy controls. Because of the new scanner, the machine will automatically know what type of pods you’re brewing. Just pick a favorite brew size and press brew button. The machine has a removable drip tray you can use when brewing single cups, or replace with Keurig 2.0 carafe when brewing multiple cups. The K200 retails for $129.99 and is available in seven colors: black, orange zest, sandy pearl, strawberry, turquoise, violet, and white. The carafe is sold separately ($30.00). There used to be two more models available- the K475 and K575 but they are no longer sold on keurig. com. You can still find them on Amazon though. Update: Keurig 2.0 system (plus) was not very successful. The fact that it can only brew Keurig branded k-cups and had numerous issues (one of the main reasons are delicate touchscreens), make people choose classic Keurig models again. The K55 is still one of the best basic Keurig coffee makers that works really well. If you want the latest model, there’s a new K-Elite – it’s much sturdier than all previous models and also has an iced coffee option. Brewing your morning cup with Keurig K200 is simple. No messing with grinding coffee beans and using filters. To make a single cup of coffee, insert the k-cup of your choice, select the brew size (4,6,8 or 10 oz) and press flashing BREW button. The mechanism to insert the pod will feel familiar if you’ve used Keurig machines before. Once preheated, the machine brews a 8 oz cup in about 49 seconds. With Keurig K200 you can also brew new Keurig k-carafe and k-mug pods. 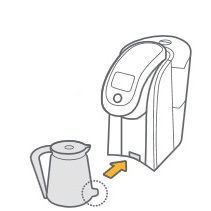 To do a carafe, remove the drip tray and insert the Keurig carafe securely in its place. Make sure to place the little cut out in the slot at the bottom of your machine. Then, take one k-carafe pod, place in the pod holder and close the handle. Select a brew size (2-3 cups, 3-4 cups or 4-5 cups) and press brew button. That’s it! The machine needs about 2.30 minutes to brew an entire carafe. K-mugs are ideal if you need more than a cup in the morning and you love travel mugs, because they do make a stronger brew. 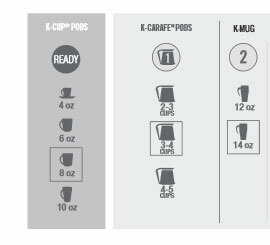 Like with k-cups, just insert the k-mug into the machine, choose 12 or 14 oz brew size and press brew button. The K200 is pretty tall and it fits travel mugs just fine. What about the bad? When you turn the machine on, it will need some time to do an initial preheating. A full reservoir (40 ounces) heats up in about 3 minutes. But, once that initial heat up is completed the heating process speed up significantly. The machine needs maybe 10, 15 seconds to heat up between brews. That’s pretty good. Keurig 2.0 K200 is compatible with three different Keurig pod options: k-cup, k-mug and k-carafe. As you probably already know, k-cups come in 500+ varieties, from more than 75 brands. The k-cup line includes coffees, teas, hot chocolates and iced drinks. But you have to make sure to buy Keurig branded pods that have white outer ring, and the black Keurig Brewed seal on the lid. K-mug is ideal for brewing 12 – 14 ounce travel mugs because it makes a stronger brew. They have no2 on the label and normally a 12 ct k-mug box cost $13.99. Right now there are 5 k-mug varieties to choose from. To brew a carafe, you will need a k-carafe pod. They have a no1 on the label and right now there are 16 k-carafe varieties. A box of 8 k-carafe pods usually retails for $12.99. K-mug and K-carafe pods are partially recyclable, as the plastic cups are constructed from polypropylene #5.But you do have to remove the lid and filter. K-cups are still not recyclable. Starbucks Verismo pods, Nespresso or the CBTL pods won’t work in Keurig 2.0. 1. You can cut the top of updated Keurig branded k-cup or k-carafe and attach it on top of your non-branded k-cup. Good news: For those of you who want to use their own coffee in Keurig 2.0 or simply prefer eco-friendly options, you can purchase Keurig 2.0 reusable filter for $14.99. This filter works with all 2.0 series brewers and it’s optimized for brewing a k-cup size (4 – 12 ounce). If you want to brew your own coffee as a carafe, you can get a different, reusable carafe filter. All Keurig 2.0 brewers include a limited one-year warranty for normal home use. Customer service help is available 7 days a week at 866-901-BREW (866-901-2739). It’s recommended to clean the external parts or the brewer regularly using a wet cloth and descaling your machine to keep it in a good shape (here’s a step-by-step guide). The system also has a new maintenance alert feature and will let you know when it needs to be descaled or when to replace water filters. for k-carafes 2-3 cups, 3-4 cups, and 4-5 cups. The difference between Keurig K200 and K250? When the K250 was first released there were two different offers, the K200 and K250. It’s important to know that the two machines are absolutely the same, it’s just about the accessories that come with them. The K200 usually was only a brewer, and the K250 also included descaling solution, k-cup variety pack, filters etc. It’s a same with the K400/475 and K500/575. It’s just about what accessories are included in the box. The Keurig 2.0 K200 is the smallest and the most affordable 2.0 brewer. It can do 9 different cup sizes, it’s fast, easy to use and with 7 different colors to choose from it will look awesome anywhere. But, if you want a machine that is built to last, Keurig 2.0 probably should not be your first choice. The limited number of k-cups and the fact that you need to buy Keurig branded k-cups or hack the machine to work with all k-cups is also not the best option. If you want a single serve machine, choosing a classic Keurig brewer is probably a better choice. People love the K55 for example. I will never buy a Keurig 2.0 that only used their own coffee. I got one for Christmas in 2016, it is nice but expensive to use. The biggest failure though is the fact that I can not drain the inner tank. I do not wish to drink coffee made from slimy water, with no way to drain and clean the inner tank I will retire this coffee maker to the garage. Also since I can not get the water out of the tank it will only become more slimy so I will quite probably never use it again. Keurig should have made a way to empty and clean the machine, guess that is why I am seeing them on clearance sale. Is this version programmable for a pod or carafe? Keurig K250 does not have a programmable option. If you would like the auto brew feature, I recommend the K475 or K575. They have auto on option for carafe. Keurig 2.0 series brewers do not have auto on option for brewing k-cups, only for carafes. Hi Fayedell, please contact Keurig customer service directly at 866-901-2739. I’m sure they can help. That’s a lovely present Susan! The Keurig 2.0 water filter doesn’t fit this model so, filtered water would be a perfect choice. Merry Christmas!